The folks at Foundation Repair Services put together this infographic. It's especially helpful this time of year as we head into winter. Fix those drafty spots! 2 Home Renovation Myths, Busted. Last month, the Science Channel crowned the hosts of the new MythBusters after a grueling competition. We're fans of people who bust myths for a living, so we thought we'd join in on the fun by busting a couple of myths that plague the renovation industry. Definitely share this newsletter with anyone you know who's planning a renovation this spring or summer...it's good info to have. New Home Renovation Tips: When Should You Move In? Congrats! You just bought a new home, one you're excited to renovate and make your own. Here's a question: when should you move in? Should you renovate first…or wait? It's hard to believe we're halfway through the summer. Before you know it, the lazy, hazy days will be over and everyone will be heading back to work, school, and regular schedules. Of course, that's assuming there's such a thing as a "regular schedule" anymore. Considering the 24/7, hyper-connected world in which we live, the days of 9 to 5 are long over. More and more people work nights and weekends, on the go and from home...at least part of the time. This is why having an at-home work space that's conducive to actual work is so important. Below you'll find some tips for creating that space along with a recent home office renovation we worked on. Do you think it's safe to put away the snow shovels? Let's hope so (and let's hope we didn't just jinx everything!). It's been a looong winter, but that only means the spring and summer will be that much sweeter, right? 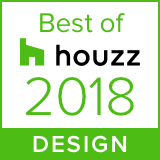 We're thrilled to announce that Hebert Design/Build has been awarded "Best of Houzz 2015" in the design category. More than 25 million monthly unique users from the Houzz community weighed in and selected us from the 500,000+ active home building, remodeling, and design industry professionals. One of the big items people need to consider as they plan their renovations is the materials they're going to use for things like countertops, cabinets, showers, backsplashes, and more. If you are planning a home improvement project in Rhode Island (or anyplace else), you have many different options to consider. One of these options is the choice of do-it-yourself or hiring a pro. There are pros and cons to either option. These are four areas you should consider before making your decision.